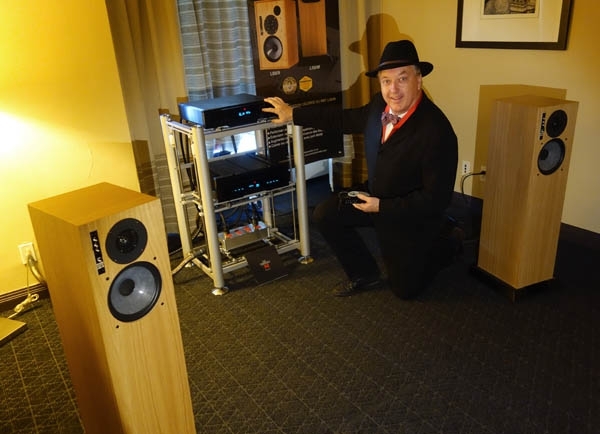 At the Montreal Audio Fest, Graham Audio’s North American distributor, On A Higher Note, brought along the British speaker manufacturer’s latest variation on the BBC-monitor theme: the LS5/9f ($US7995/pair in oak, as shown), described as a floorstanding version of the BBC-designed LS5/9 stand-mounter. According to On A Higher Note’s Philip O’Hanlon, seen above, the LS5/9f was created by Derek Hughes, the son of the founders of Spendor (themselves once a BBC licensee—this is slightly complicated). Hughes reportedly intended the extra cabinetry to support the speaker without adding to its internal volume or otherwise altering the essential LS5/9 sound. In a system with a Gryphon Audio Diablo 120 integrated amplifier ($9990) and Scorpio S CD player ($9400), Artesania Exoteryc equipment rack, and Truitt Physics cable, the Grahams were remarkable for both their bass extension and the clarity of the information within that range—I could hear, literally for the first time, the interplay between the double bass and the kick drum in Lou Reed’s “Walk on the Wild Side”—and on a large-ensemble version of Duke Ellington’s “It Don’t Mean a Thing (If It Ain’t Got That Swing),” the soundstage was remarkably deep. Among the best-sounding systems at the show.